For those of you already building cutting-edge applications with WPF and Telerik's RadControls for WPF, there is a new service pack out that you should check out. 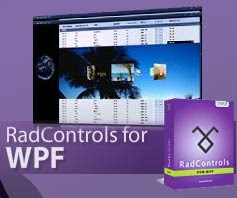 Officially released yesterday, the first service pack for the Q2 2008 RadControls for WPF is mostly a bug-fix release. There are a few added small features to RadGridView and RadNumericUpDown, but there no significant new features or new controls in this maintenance release. So, I guess this is release is more like a "Vista SP1" than a ".NET 3.5 SP1." Either way, you can check out the release notes for all the nitty-gritty details and then download the updated bits directly from your Client.net accounts.